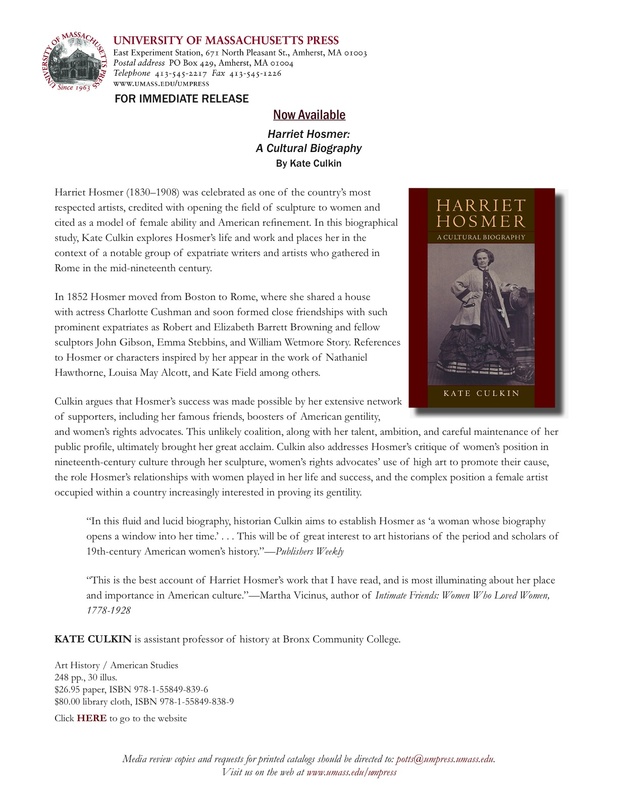 Get Harriet Hosmer: A Cultural Biography in libraries. The edition of Harriet Hosmer with the library binding is now available. A library binding is a very durable hard cover, without a dust jacket. If you are affiliated with an academic institution, please consider requesting the library purchase the book. Or if you have a favorite branch of your local public library, please suggest that branch purchase the book. Thanks, from the daughter of a librarian. Below are pictures of Audrey checking out the edition. The official press release will be distributed in an “e-mail blast” on Monday. The Museum of Fine Arts, Boston opened its new Art of the Americas wing last week. Which is good news for any fan of Harriet Hosmer, because Hosmer’s Sleeping Faun is now once again on display, in the Penny and Jeff Vinik Gallery. It was donated to the museum by Cornelia Crow Carr, Hosmer’s life-long friend, in 1912. You can see an interview, and some good footage of the collections, with the museum’s director here. I can’t wait to visit. Harriet Hosmer talks this week–a roundup. Thanks to everyone who came out to hear me speak about Harriet Hosmer in the Syracuse University History Department and at the River’s End yesterday. And thanks also to those who tuned into the Stonestreet Cafe. (Remember if you missed the show, it will eventually be archived on the site. Although, unfortunately, that version won’t include the wonderful music Julia selected, including Nina Simone and Celia Cruz.) In the biography, I discuss how having a great network of friends was critical to Hosmer’s success. And I feel very lucky this week to have so many people willing to support me as I bring work of Hosmer and my biography to the public. Carol, Bill, Mindy and Julia, I am lucky to know you all. 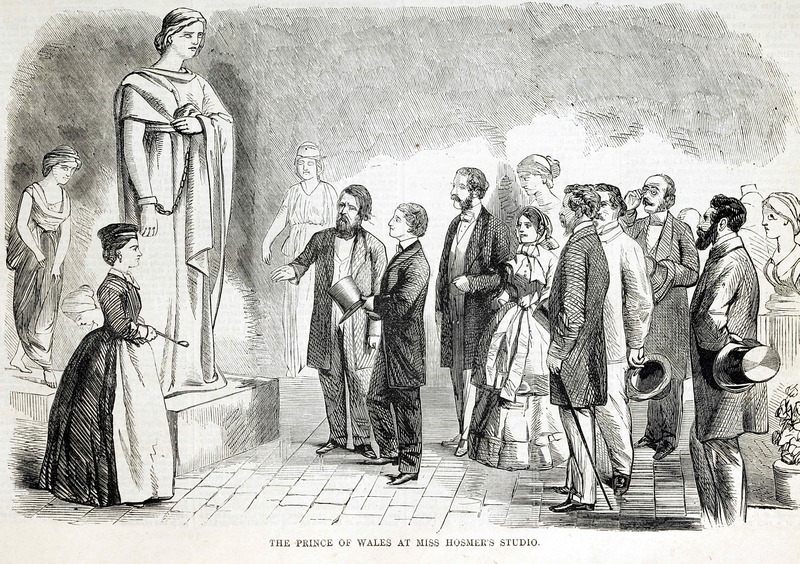 As all eyes turn to England and questions of who will design Kate Middleton’s wedding dress fill the airwaves, I am reminded of Harriet Hosmer’s encounters with a member of the English royalty. In 1859, the Prince of Wales (later King Edward VII) visited Hosmer’s studio and saw her at work on Zenobia, one of her most famous works. Harper’s Weekly published a cartoon of the encounter, depicting Hosmer’s mentor John Gibson discussing the work with the prince. Hosmer encountered the prince again at a ball in his honor in Boston in 1860, when he told the artist he kept his copy of her work Puck in his rooms at Oxford. In addition to discussing my biography of Hosmer on Nov. 19th at the River’s End in Oswego, NY, I will be giving a talk earlier in the day at Syracuse University. I’ve never been to the school, although I have driven by the dome many times. And my family is all about the Big Orange come Sweet Sixteen time. My grandfather went to the law school, and my grandmother earned her B.A. there, after graduating from the Normal School in Oswego. (She taught during the school year, then took classes at Syracuse in the summers.) Below is a picture of them in their Syracuse attire. 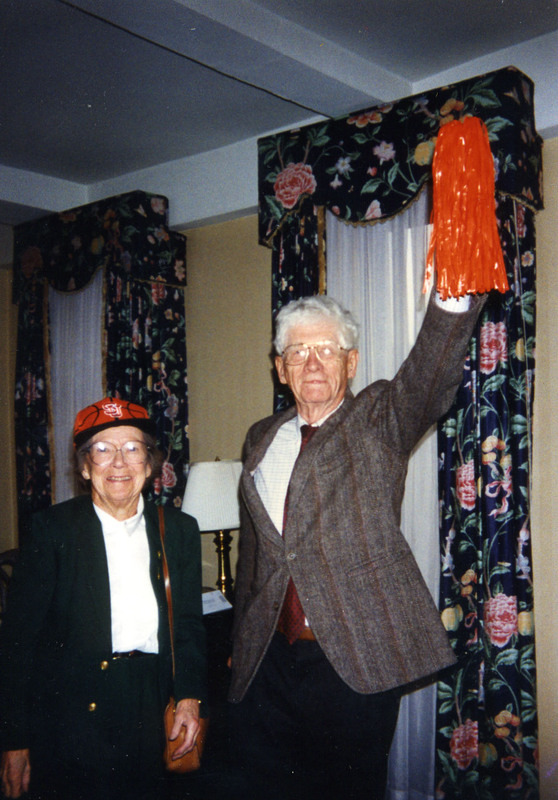 We were heading off to a pep rally in NYC in 1996, when Syracuse when to the finals. It was the first time the finals had been held in the NYC area since the point shaving scandal of 1951, which involved 4 schools from the city.